Annalee Joy to the World Mouse. Annalee Collectible Dolls , now in the UK. These beautiful Dolls are handmade using traditional materials just as they were made many years ago.The faces are handpainted with each smile carefully copied to give the unique Annalee look.Click here to read the story of Annalee. 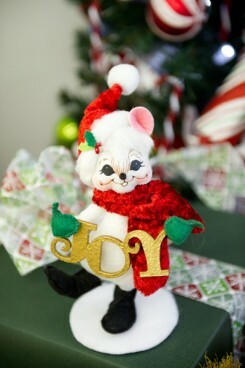 This is the Joy to the World Mouse and stands at 6" high. Take a look at the other Christmas Collection Dolls. Start your collection of these unique dolls today. Ideal for a unique gift for Christmas. We recommend choosing recorded delivery for these items.